I picture of one of my furry characters, Sasha Skunkdale made for my Advanced Problems in Drawing I class. We pretty much got to make whatever we wanted in it so I went with cartooning in the hopes that I could develop more of my own original work. 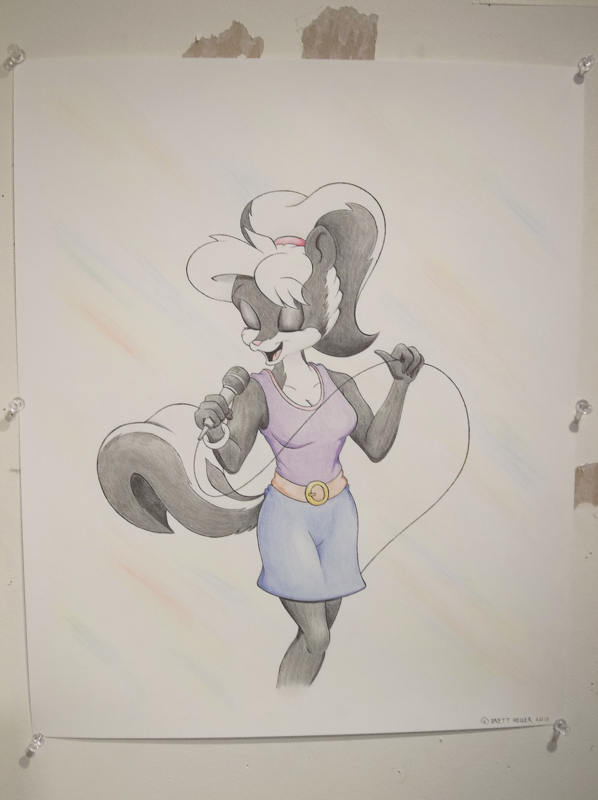 This was done with colored-pencil on bristol board and was mainly influenced by this song https://www.youtube.com/watch?v=wCVrC7Dg2qo (It's hard to not feel good while listening to it) I made this to give a bit of an idea of Sasha's personality; she has this kind of cheerful, happy-go-lucky personality, always looking on the bright side, ect. She also loves to sing and she's quite good at it. She hopes she can use this talent to land a career as a pop singer. Sorry the photo-quality is crap. If there was a scanner big enough, I would have just scanned it to my flash drive on a computer. Trust me, it looks a lot better in person. Another character I made for Advance Problems in Drawing in college. This is Nathan, Sasha's cousin. He's so bored, he's just lighting matches and flicking them on the floor without a care in the world. I kinda struggled while creating him, I just couldn't figure out his personality; tried to decide between quirky wierdo or prideful, opinionated guy who could make something of himself, but is "too real" for this world. Ultimately, I went with the latter. I think it fits him better, being a fox, though I did add a little of the quirkiness in him.